The Grateful Dead themselves epitomizing Duke Ellington's definition of the excellent as being "beyond category," have south access to sources of the imagination which transcend "Western" or "Eastern" categories of history and culture. Their music asserts that we are liberated, not enslaved, but such an acceptance of total awareness, and their pilgrimage to the Great Pyramids of the Nile, the cradle of revealed cultures, is made with the understanding that men and women, many thousands of years ago, also aspired to voyage to the stars in their search for a pure and universal humanity. 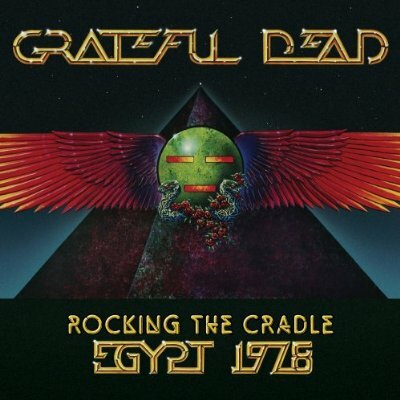 In the course of the return flight from Cairo in the fall of 1978, Hamilton Eddy gave me this assessment of the Grateful Dead in Egypt, and though like the event itself, he has disappeared Sphinx-like beneath the sifting sands of time, his words have haunted me ever since. Thirty years later, it's time to tell the tale, a tale that begins, at least to our normal faculties of recollection, during the Dead's 1972 European tour. On a day off, I took Mountain Girl, Phil, and Jerry on a ride to the ancient megaliths of southwest England, visiting man-made Sidbury Hill, Avebury's megalithic circles, and Stonehenge. These intrepid voyagers were ever interested in the patterns of the past and the meanings of the moment, and the idea occurred to them that profound energies might be tapped, and their music enhanced, at ancient sites around the world. An idea was born. In London we hung out with John Michell, whose books had reawakened a generation's interest in arcane perspectives on Earth energies. The old straight track beckoned. Later, manager John McIntire would approach the record company with the idea of an archaeological mystery tour, but nothing came of it. We would have to bootstrap this gig. Nineteen seventy-two was also the year that President Anwar Sadat evicted the Soviet military advisers from Egypt, a gesture toward the West in the Cold War era that eventually opened the way geopolitically for the Gizah concerts. A parallel track was underway whose synchronous conclusion at the concerts would blow the minds of many a head. Kesey's article "In Search of Secret Egypt" appeared in Rolling Stone, the Dead released Blues for Allah, with its lyric references to the Middle East conflict. But it took then-manager Richard Loren's private pilgrimages to Egypt to bring home the actual possibility of playing at the Great Pyramid. In the fall of 1977 the band appointed an Egypt Committee: Phil, Richard, and myself. Planning for a scouting trip to Cairo began. Ironically, the first hurdle was local, for Bill Graham wanted to promote the concert himself. This caused the famous "Egypt or Bust" controversy between Mickey and Bill about the right approach, since traditional methods of concert promotion were not going to work. We would have to bootstrap this gig. A period of diplomatic fire walking began. From this was born the Egypt Committee's new moniker, "The MIDS." We became the Men In Dark Suits, because to accomplish our goal, we had to dress the part. At this time Sadat made a bold and unprecedented visit to Israel and addressed the Egyptian people and the Israel Knesset with words of reconciliation and peace. A magical glimmer of hope illuminated a troubled world, and into its crack of light the MIDS took their dream. Donning our suits, we first went to the U.S. State Department to be vetted for fitness as cultural ambassadors. We threw a party at a fancy D.C. hotel for State staffers who later wired associates in Egypt: the Grateful Dead are cool--do what you can to help. Joe Malone, our Middle East consultant, introduced us to the Egyptian ambassador. In a memorable exchange, an authentic understanding was reached between Ashraf Gorbal and Phil about the reasons for the concert. Phil said, "I am interested in how the different places we play affect our music, and I can think of no greater venue than the Great Pyramid." On to Cairo went the MIDS. Cairo is a teeming city of the old world, where camels, donkeys, antique buses, and limousines all vie for space on the thoroughfares, and Richard, Phil, and I bustled about its dens and hotel lobbies, trying to match our pacing with that of the sanctioning power, Saad el Din, the Minister of Culture. It took a week, but in the end we could send our telegram back home: "ATTENTION GRATEFUL DEAD. EX PYRAMID CARAVANSARI. MISSION REPORT. 21 MARCH 1978, CAIRO. TWO COUNT THEM TWO OPEN AIR CONCERTS AT THE GREAT PYRAMID SPHINX THEATRE IN LOWER EGYPT CONFIRMED REPEAT CONFIRMED FOR SEPTEMBER 14 AND 15. STEERING COMMITTEE LANDING SFO THURSDAY WITH SIGNED REPEAT SIGNED AGREEMENT. YES, YES. MIDS." Later we would add a third night, September 16, as though history required it. But before returning, MIDS hired a car whose driver took us to Upper Egypt at a speed that would have been reckless had it not matched the way energies are funneled through the narrow valley of the Nile. Richard introduced us to his friend Abdul Atti, boatman at Luxor. Sailing across to the Valley of the Kings, resting place of Pharaohs, I had an epiphany of the Four Elements of the ancient world. Banded in my field of view were Water, Fire, Earth, and Air--blue, green, brown, azure--where Fire consisted of the illumined life energies of the Nile's banks. Flame was not in this picture, and this was revelation indeed. The concerts were six months away. We made two more advancing trips to Egypt, meeting with the Egyptian Department of Antiquities, who managed the Gizah Sound & Light Theater (Sphinx Theatre); with the secretary to Madame Jihan Sadat, to whose favorite charity, Wafa'a wal Amal (Faith and Hope) Society, half the concert proceeds would be donated (the other half going to the Department of Antiquities). Richard arranged with The Who for the loan of their PA system and recording truck and its transportation to Cairo from London. This would turn out to be a mini-adventure of it own, with customs clearance delayed by Alexandria's port authority. But the trucks arrived for the concerts in the nick of time. Meanwhile, Mickey was hot on the cultural ambassadors' trail. He invited Hamza El Din to open the shows. Hamza, Sudanese virtuoso of the stringed Oud and a mentor to Mickey's Tar drum expertise, arranged for the Nubian Youth Choir, a group of singers, dancers, and hand clappers, to join him. A seamless bridge to the Grateful Dead's music was painstakingly worked out in the studio. Mickey planned his own postconcert recording odyssey to Hamza's village far south of the Nile cataracts. Things were falling into place. To pay for this trip, Richard booked two gigs at Colorado's Red Rocks Amphitheatre and one at Giants Stadium in New Jersey, where the official announcement of the Egypt concerts was made. Within days a charter flight was on its way to Egypt. Many old associates came along. We had booked all the rooms at the Mena House hotel, right below the Great Pyramid, and this elegant institution, home to generations of archaeologists, was soon transformed by the Grateful Dead's "extended family" into a colorful parade. At all hours you might find Bill Walton, Paul Krassner, Kesey, and assorted Pranksters, David Freiberg, Bill Graham, the Bear, band members, and assorted Dead Heads poolside or in the lobby. Impromptu expeditions went to pyramid and temple sites south of Gizah; to Nile side restaurants in Cairo; camel rides, horseback riding, climbing the Great Pyramid, exploring its inner dimensions (where Kesey famously played "Home on the Range" on a mouth organ); visits to the local market at Mena Village. All this went on for days as the technical setup at the Sphinx Theatre slowly came together. Bill Graham arranged a breakfast for all at a Bedouin tent restaurant some miles south on the uninhabited and non-tourist side of the Gizah plateau. We feasted, rode horses, and had a great time. Afterward, my friend Katie and I walked back across the stony desert to Gizah, and I had my second epiphany: halfway back the sun at midday had turned the desert into the proverbial furnace, and we feared that thirst would do us in. We made it. But later that day the equipment truck was not so lucky, since it got stuck in the sand and had to be towed by a tractor, and when that also got stuck, camels came to the rescue. But when September 14 dawned, all was ready. That evening, Egyptian dignitaries from Cairo, including Madame Sadat, occupied the first row. This was a cultural event, long anticipated by the youth of Cairo, who mingled with Dead Heads who had converged on Gizah from the U.S. And Europe. Bill Kreutzmann observed that by the third night the locals had picked up their distinctive dance, even as he, who had injured a hand shortly before leaving the U.S., beat out the rhythms, noting that, "In the land of the limbless, a one-handed drummer is king." The Bedouin agreed, for soon their silhouettes could be seen moving in synch on the sand. The concerts played with time and space, as Egypt itself is timeless. The mass of the Great Pyramid warped local dimensions. The vast, ancient structures with which the music of the Grateful Dead attempted to come into phase and alignment hosted us in silent grandeur. We tried to draw them into the music by using the King's Chamber deep inside the Great Pyramid as an echo chamber. Dan Healy set up a radio link from a PA tower to the corner of the Great Pyramid, and from there John Cutler had run a 2,000-foot length of wire up through the Ascending Passage and the Grand Gallery to a speaker in the King's Chamber. A microphone picked up the sound and sent the feedback to the radio relay and thence to Healy's mixing console. Throughout the first set on September 16, I traveled back and forth between these locations, facilitating communications. Courtenay Pollock, original Grateful Dead tie-dyeist, "om-ed" in the Sarcophagus. Ultimately we failed to make the connections work, and the Great Pyramid remained a silent witness. Some said that a genie had bamboozled us; others that the wiring was cheap and flawed. But as I went back and forth from the stone silence of that inner chamber to the festive panorama of the concert, I felt an enhanced connection to the music of the spheres. It helped that the full moon was in total eclipse, a cosmic event unforeseen when the MIDS booked the concert dates six months before. But such entrainment was the order of the day, for another event was taking place. The Camp David peace talks between Begin and Sadat, which had been in secret negotiation mediated by President Jimmy Carter, were even at that moment reaching agreement, and on the following day, September 17, the historic Peace Accord between Israel and Egypt was signed. To have found ourselves simultaneously in tune with cosmic and worldly events at the Great Pyramid was a humbling experience. Afterward, band, family, and friends moved in different directions, one of the most memorable of which was a trip to Upper Egypt. We visited the temples of Luxor and Karnak, and sailed the Nile to Aswan for three days on Atti's boat sleeping on deck like a row of mummies. Richard, his cameraman, Teppei, and occasionally myself filmed this one-of-a-kind vacation for the documentary "home movie." On one occasion, attempting to film Donna and Jerry on donkeys for a hazardous trek over a mountainous trail, Garcia felicitously redirecting my amateur photographer's eye to a hawk circling overhead. Horus, Egyptian God and symbol of renewal, accompanied us. In one final synchronicity, the Tutankhamun Exhibition opened in San Francisco soon after we returned. The organizers honored the Grateful Dead and company with a private showing of the contents of the tomb the MIDS had visited six months before in the Valley of the Kings. We would've played here if the audience had been here or not. But the reality of it, as it's unfolded, is that the audience has become as much a part of the show as Egypt, the Pyramids as the ideal. If you were to think of this whole thing as a piece of concept art, rather than as a performance, they are full participants. This album was released in August 2008.